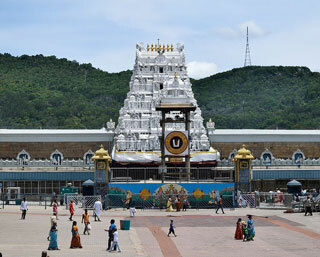 Sri Venkateswara Swamy Temple is a landmark Vaishnavite temple situated in the hill town of Tirumala at Tirupati in Chittoor district of Andhra Pradesh, India. The Temple is dedicated to Lord Venkateswara, an incarnation of Vishnu, who is believed to have appeared here to save mankind from trials and troubles of Kali Yuga. Hence the place has also got the name Kaliyuga Vaikuntham and Lord here is referred to as Kaliyuga Prathyaksha Daivam. This article uses material from the Wikipedia article "Venkateswara Temple, Tirumala", which is released under the Creative Commons Attribution-Share-Alike 3.0 License.